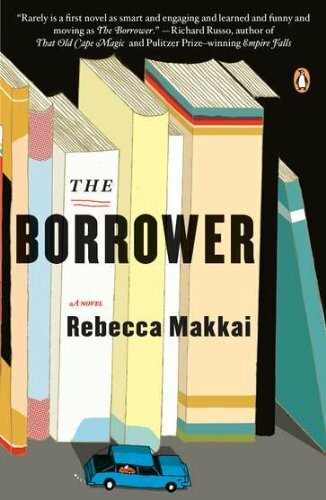 I had so much fun reading The Hundred-Year House, I just had to find a copy of Rebecca Makkai's debut novel from 2011 that I somehow tragically missed when it was first published. And while I don't think The Borrower is the multi-layered towering achievement that The Hundred-Year House is, it's the most whimsical story about a kidnapping I've ever read. It's also chock-full of delightful literary references, and I love me a book about book lovers. Lucy Hull is a librarian almost by accident. Like many English majors, she isn't sure what she wants to do with her life, so she starts working her way down an alphabetical list of alumnae from her college, aimlessly making calls to see if someone will connect her with a job. She doesn't have a library science degree, but a librarian named Loraine in Hannibal, Missouri desperately needs a children's librarian. So Lucy is hired and takes her place in a scratchily-upholstered desk chair, scanning and stamping books and no closer to figuring out her life than she was before. Then she meets Ian Drake. Ian is ten, a little bit of an odd cookie, and a frequent flyer in Lucy's children's section. His book choices are tightly restricted by his hyper-religious mother, who actually gives Lucy a printed list of topics she'd like Ian to avoid (spoiler alert: Roald Dahl and Lois Lowry do not pass muster). Wanting to encourage Ian's love of reading, Lucy checks out books for him on her own account, and Ian smuggles them home in his pants. Lucy feels good that she's helping expose Ian to broader themes and life lessons, especially when she discovers that his parents are sending him to weekly “pray the gay away” sessions with a man called Pastor Bob. It's all fairly harmless, until Ian runs away from home and spends the night in the library. When Lucy discovers him the next morning, she has every intention of taking him straight home—but once in the car, Ian is vague about where exactly his house is. Instead of taking any number of responsible actions, Lucy decides to just keep on driving, right out of Hannibal. On one level she knows it's crazy (and punishable by law) to take Ian with her on some ill-advised road trip, but she can't bring herself to return him to a family that tells him he needs to change. And won't allow him to read Tuck Everlasting. Maybe librarians aren't just dusty spinsters in cardigans. Maybe Lucy recognizes her power after all. Maybe she and Ian will be okay, despite his fundamentalist parents and her felonious choices. Maybe books can do a lot more than we think.